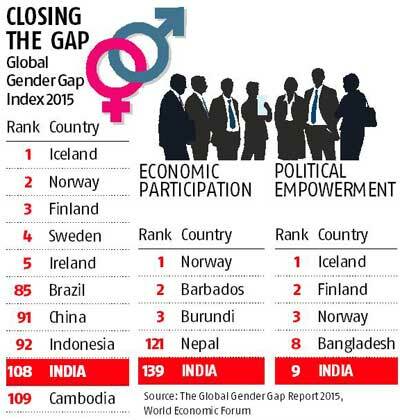 India has performed poorly in removing gender-based disparities, ranking 114 out of 142 countries in World Economic Forum's 2014 gender gap index, scoring below average on parameters like economic participation, educational attainment and health and survival. According to the World Economic Forum, women now earn what men did a decade ago, underlining the sluggish global progress made in bridging the gender divide over the past 10 years. Women in the workforce – India fell five places and ranked at 139th out of 145 countries. Female to male ratio – India’s labour force participation is 0.35 compared to 0.36 last year. Income disparity – Women earning an estimated average of $2,257 per year compared with $9,175 for men.